Positioning: Investors have been caught leaning the wrong way. They are just starting to play catch-up, but sentiment remains overly skeptical. Growth surprise: A US recovery has caught most people off-guard (though I in the minority when I was bullish during the market panic in January, see Buy! Blood is in the streets!). Central bank accommodation: The Federal Reserve has been ultra-cautious in its policy of interest rate normalization, which is an enabling factor for equity price gains. While I am starting to have concerns about equities on valuation grounds, the market is likely undergoing a blow-off phase where if participants hold their noses and buy, they could enjoy some truly bubbly profits. I have long had much respect for the folks at Lombard Street Research (LSR) for their unusual non-consensus calls. Back in the days of the Tech Bubble when everyone was focused on the likes of Cisco Systems, Lucent, Nokia and other technology darlings, they had said "watch China" as the next engine of growth. That turned out to be the Big Call that made me forever remember them. 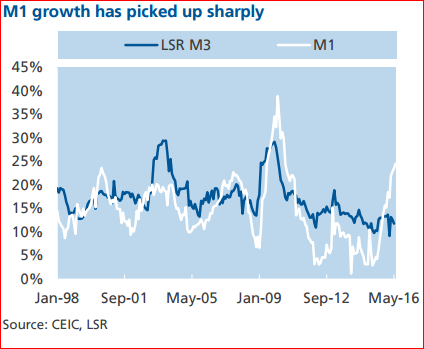 It was therefore with great interest when a Bloomberg story came across my desk indicating that LSR believed that China may be in a liquidity trap. While Chinese M1 growth has been picking up sharply, LSR`s estimate of the growth the broad money M3 has been slowing, which led to the conclusion of a possible liquidity trap. 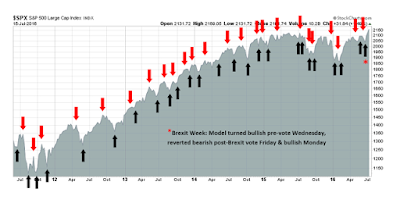 Mid-week market update: After the stock market rally off the panic Brexit bottom that took SPX to new all-time highs, the market has been in a tight trading range for the last 10 trading days. As the chart below shows, the 5-day RSI, which is a useful short-term trading indicator,flashed a sell signal several days ago as it retreated from an overbought reading into neutral territory. This "should" have pushed the index down further, especially with the slightly hawkish tone from the Fed today. The logical initial support level is the mid-Bollinger Band, or 20 day moving average (dma), which is rising quickly but current stands at 2140. The next support would the the breakout level at about 2120. However, the slightly hawkish statement from the FOMC was not enough to push the market below the tight consolidation range. A market with a weaker tone would have fallen to at least test the initial support level, but it hasn't. 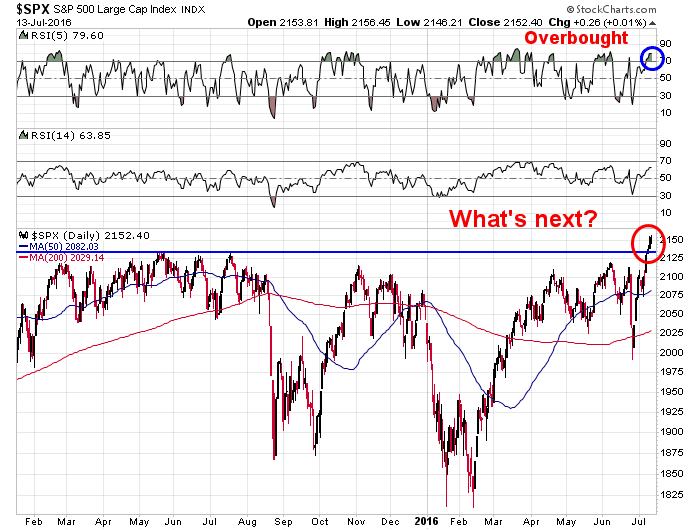 The key question for traders is, "Is this consolidation or corrective period over?" FOMC preview: How hawkish the tone? As we approach another FOMC this week, much of the short-term tone of the market will depend on the Fed. In order to analyze what the Fed is likely to do, let`s begin with their mandate, which is price stability (fighting inflation) and full employment. In addition, the Fed has taken on a third objective of financial stability. When I look at what`s happened since the Brexit vote, all signs point to a renewed path towards interest rate normalization. Therefore it would be unsurprising to see the FOMC statement take a more hawkish turn. Expect the post-meeting buzz to focus on one or two rate hikes for the remainder of 2016. No, I am not turning bearish on stocks despite the title of this post. However, the value side of my inner investor is starting to get a little nervous. The market has risen to a level that can be described as either fair value or slightly overvalued. In addition, the behavior of "smart" investors like insiders are also raising cautionary flags that serve as early warning signs of limited upside potential. On the other hand, the US economy is undergoing a growth revival, which is helpful for higher stock prices. In addition, the market is experiencing powerful momentum in the form of a FOMO (Fear of Missing Out) rally that's still in its early stages. The irrational exuberance scenario that I postulated two weeks ago (see How to get in on the ground floor of a market bubble) is becoming my base case. Under those circumstances, stock prices can rise further than anyone expects. My preliminary conclusion is we are seeing the late stages of a market blow-off that will ultimately mark the top of the bull market that began in March 2009. We are in the 7th or 8th inning* of this bull and there are still gains to be made, but longer term investors should start to begin to exercise some caution. * For readers unfamiliar with baseball, a normal game lasts 9 innings. If the score is tied after the 9th inning, then extra innings are played until a winner is determined. The reaction to Donald Trump`s speech to the Republican convention has been highly bifurcated. Mainstream media and analysts mostly reacted with horror and raised cautionary notes about his campaign of fear (see The New York Times and The Economist), while social media lit up with "I would totally vote for this guy" messages. 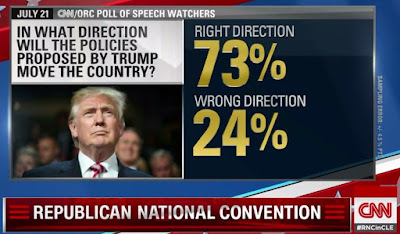 Never mind the pundits who fact checked Trump and pointed out the distortions. If you are a believer in the Trump message and you weren't sure if he will win, what would you do with your portfolio? The answer is to buy gold. That viewpoint sets up the Trump Arbitrage: If you believe in Trump's assessment of America, you would buy gold. If you thought that things aren't as bad as the Trump view, you would buy stocks. You would buy hope - and innovation. The Trump Arbitrage trade is either gold, or stocks. Here is the gold vs. equities pair trade, which remains largely range-bound for most of this year. Here is how I would evaluate the Trump Arbitrage Trade. When will the bulls take a breather? Mid-week market update: As stock prices have recovered strongly off the Brexit panic bottom to make a new all-time high, there are numerous signs that the market is ready to take a breather. 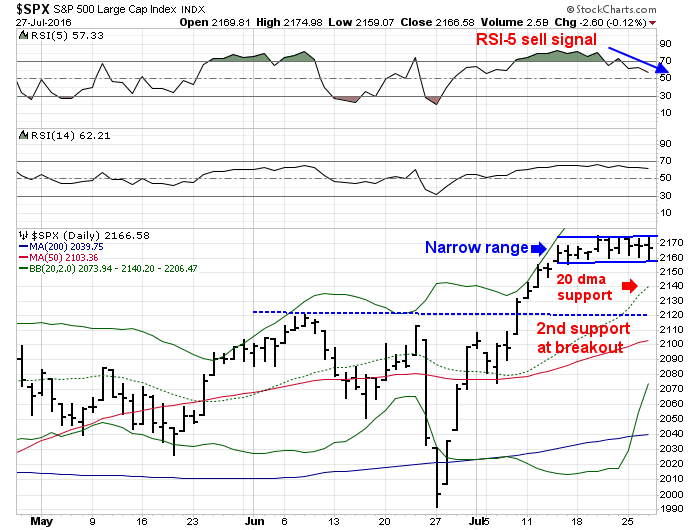 In all likelihood, a period of sideways consolidation or minor pullback is on the horizon. 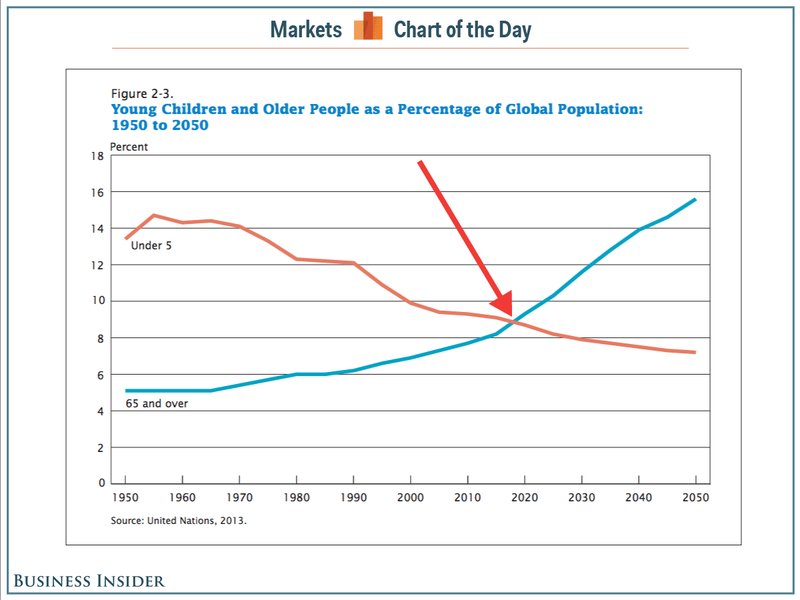 When I was a boy, I can remember the Zero Population Growth (ZPG) movement, which was a response to the Club of Rome's Limits to Growth Mathusian thesis of "the world has limited resources, but human population is rising exponentially and therefore ecological disaster looms". Somewhere along the way, birth rates fell in response to global industrialization, rising incomes and changing incentive structures. In an agrarian society, children are potential units of production. They can be put to work in the fields and support you in your old age. In an industrialized society, children are cost centers. 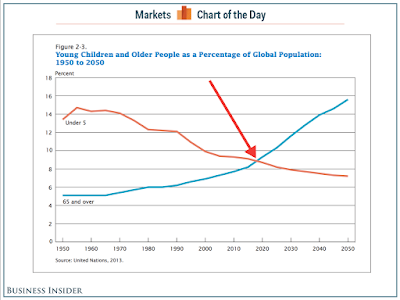 It was no wonder that birth rates fell as the emerging market economies boomed. A demographic shift like this raises all sorts of questions. For investors, it brings into the question of future returns as Baby Boomer demand for retirement income starts to dominate capital market returns and strain government retirement benefits. For policy makers worldwide, the issues are how to fund retirement benefits, as well as how to structure policies to transition to an aging society. I also suggested last week that the market was on the verge of a growth surprise (see How to get in on the ground floor of a market bubble). The combination of an equity market friendly policy environment and positive growth surprises are acting to push stock prices higher. How much "runway" does China have left? As we await China's Q2 GDP report in the face of sharply lower June trade figures, it's useful to ponder once again the China tail-risk question. 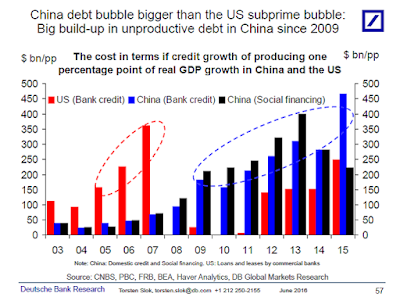 For years, analysts have been warning about impending doom in China because of the growing mountain of unsustainable debt (see Kyle Bass, Jim Chanos, Andy Xie and George Soros). In the past, every time China has gotten to the edge of a hard landing, Beijing has confound the bears by kicking the can down the road and forestalling a crisis. That kind of "extend and pretend" strategy is perfectly viable if the road is long enough, but the key question for investors is, "How long is the road?" A dangerously extended market, or a FOMO rally? 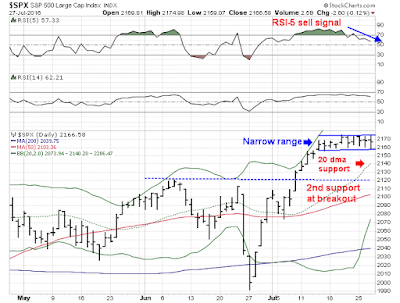 Mid-week market update: The SPX has staged an upside breakout to new all-time highs and indicators are looking overbought. Now the key question for traders is whether current conditions represent an extended market that`s ripe for a pullback, or does do these conditions represent a "good" overbought condition that accompanies a momentum surge, which leads to a Fear Of Missing Out (FOMO) rally? Several months ago, the internet was all abuzz over the victory of Google's AlphaGo program beating Go grandmaster Lee Sedol (see story here). As the game of Go is a computationally and mathematically complicated game and the number of variations in the game is an order of magnitude higher than chess, it was a great victory for the kinds of "deep learning" artificial intelligence (AI) techniques pioneered by Google's Deep Mind team. “Get me a pizza from Pizz’a Chicago near my office,” one of the engineers said into his smartphone. It was their first real test of Viv, the artificial-intelligence technology that the team had been quietly building for more than a year. Everyone was a little nervous. Then, a text from Viv piped up: "Would you like toppings with that?" * The title was inspired by an old science fiction short story entitled "If all men were brothers, would you let one marry your sister?" Cullen Roche wrote an article last week in Marketwatch making the case that the US equity and real estate market is ripe for the formation of a market bubble. What’s even more interesting is that this environment appears (at least in my view) to be ripe for a financial-asset bubble. That is, as weakness abroad drives yields lower in the U.S., stocks and real estate look increasingly attractive. Stocks have clearly benefited from this “reach for yield,” as have certain types of higher-risk bonds. Indeed, as government bond yields turn negative around the world, US Treasury assets seem to be the only yield game in town. Investors are rewarded with the additional bonus of steady US growth. 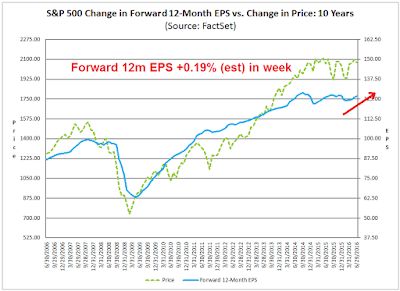 Stocks should benefit as falling UST yields translate into P/E expansion. But we haven’t seen the big boom in real estate yet (with the exception of, maybe, San Francisco). But could we be there? I am not certain, but here in Southern California the chatter is starting to get a little crazy again. As rents rise rapidly and future returns on stocks and bonds just don’t look that great, many people are turning to real estate. When rational people start saying irrational things, my ears perk up. And it makes me wonder (still) if we’re not on the precipice of something that looks a lot more like 1999 than 2008. Add it all together and it makes you wonder: Are we ripe for a big financial-market bubble, thanks in large part to foreign economic weakness? It might seem paradoxical, but don’t discount that risk. A NFP preview: When will the Fed raise rates again? In the wake of the Brexit shock, Fed governor Jerome Powell was the first Fed speaker to give a speech, which gives some clue to the direction to Fed policy. While what the Fed does near-term is important to traders, the longer term thinking is important to investors as the definition of the Fed's reaction function to events will affect the timing of rate hikes, the next recession and the next bear market. 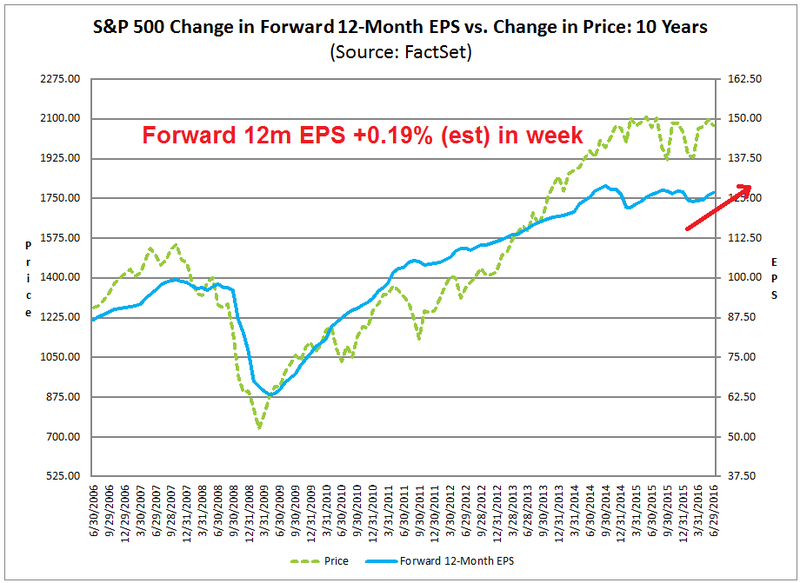 In the past few months, I have received a lot of feedback and criticism over my use of forward 12-month EPS estimates, such as the chart below that appeared in last weekend`s post (see Brexit panic: A gift from the market gods?). I would like to clarify why this form of analysis matters and this is a valuable technique to beat Wall Street analysts at their own Earnings Game. Brexit panic: A gift from the market gods? A gift from the market gods? 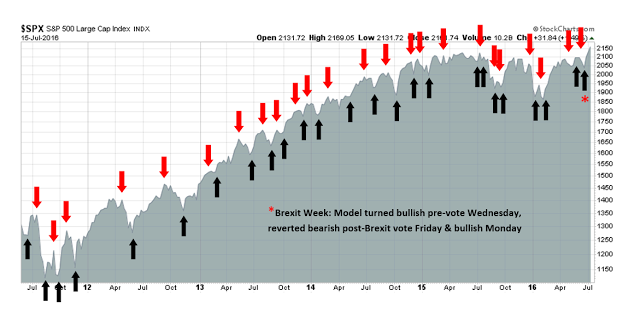 Now that Mr. Market has decided that Brexit has been "fixed", it's time for a sober second analytical look at the impact of this historic decision by the UK electorate on the US equity market. The knee-jerk market sell-off appears to be a gift from the market gods to investors. The economic impact of the event on the American economy seems to be relatively minimal. Risk premiums have risen in response as the world is witnessing a repeat of the usual European theatre, whose last major production was staged during the Greek crisis of 2011.